Heroes without battle, Dungeons without monster. 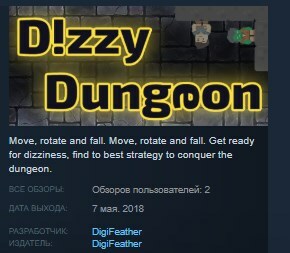 Dizzy World - Get ready for dizziness. In this world you have the power to change the direction of gravity. In simple words: rotate the world, rotate everything. Some of dungeon objects will fall down and some will not. Rapidly rotate and move, change the structure of the dungeon, clear or build a path to the exit. Dangerous Dungeon - No monster at all, but still full of trouble and dangerous. Boxes will fall down and smash you, spike and saw will kill you. Electric box and lock will block your way. Portals make thing more complicated. Handle them directly or find another way to avoid them, make your own strategy. Character - 5 different characters with their own specialties. Some of them good at climb and fall, and some are good at power or magic. Each character can be setup with equipment and items fit to their class, boost properties, allow you to create more efficient strategies. Special Ability - Each equipment provide a unique skill, such as break obstacles on the way, push things around, create box to climb, pick lock, teleport, even more powerful magic can change the dungeon structure entirely. Ranking System - Each dungeon have standard solving steps count, that is just the start. You can always beat that by finding a better way to solve it. There are leader boards for every dungeon so you will know how your strategy works compare to other players. Also that is a total score leader board let players know how they performed generally.